Unibail-Rodamco-Westfield and Virgin Pure have unveiled purified water refill stations in Westfield London and Westfield Stratford City, in a move to encourage the 77m shoppers who use the centres each year to move away from single-use plastic. Visitors will be able to sample the brand’s popular table-top WaterBars and stay hydrated whilst they shop the January sales and enjoy their time spent in Unibail-Rodamco-Westfield’s London centres. One refill station has been permanently installed in each destination, with plans to introduce another four by the end of 2019. In-centre media screens will help direct people to the stations, where signage welcomes visitors and passers-by to ‘Refill Here’ with unlimited, perfectly chilled, pure water at the touch of a button. Virgin Pure’s WaterBars remove bacteria, chemicals and toxins, reducing chlorine by 99%, while retaining essential minerals like calcium and magnesium. The result is great tasting and refreshing water, ideal to keep hydration levels up whilst at home or out and about. Virgin Pure previously had a kiosk at Westfield London, allowing visitors to sample pure water and discover a new way to drink water at home. The WaterBars offer unlimited, chilled and boiling pure water on tap and include smart features such as energy saving sleep and wake-up modes, auto fill levels and precise temperature controls. 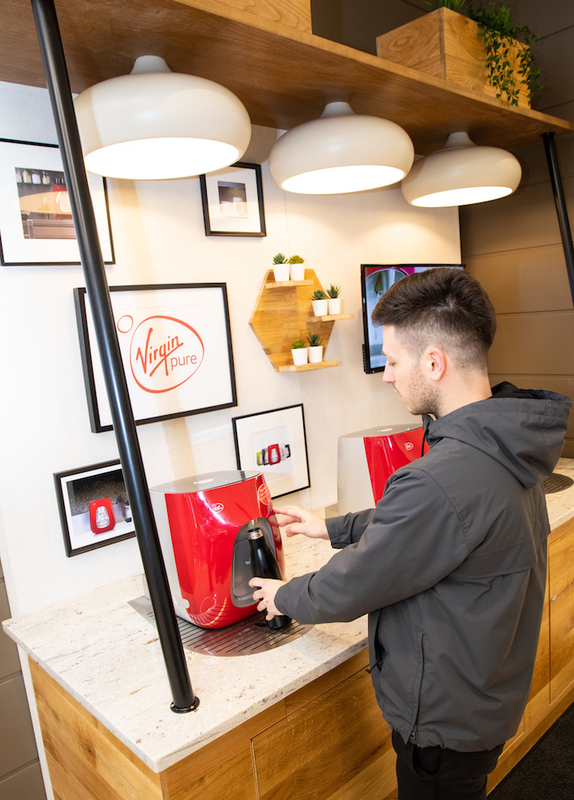 As part of the commercial partnership, Virgin Pure’s WaterBars have also been installed in Unibail-Rodamco-Westfield’s UK offices at each centre for company employees.